According to results from a private autopsy, Michael Brown, the unarmed teenager who was killed by a policeman in Missouri last week, was shot at least six times, including twice in the head. The preliminary results show that one bullet entered the top of Brown’s skull, suggesting that his head was bent forward when it struck him. This was probably the last bullet to hit him, said Dr. Michael M. Baden, the former chief medical examiner for the city of New York who flew to Missouri to perform the autopsy at the family’s request, reported the New York Times. Preliminary results from a state autopsy were released on Sunday, however they only confirmed that Brown died of gunshot wounds and did not admit to how many. Brown’s family then requested a private autopsy also be carried out. Baden also revealed that Brown was shot four times in the right arm and once in the forehead, all from the front. No gunpowder was present in the body, which suggests that the bullets were not fired at close range. However, this result could change if gunpowder is found on the teen’s clothing, but Baden did not have access to this. U.S. Attorney General Eric Holder on Sunday also ordered a federal autopsy on the 18-year-old victim. 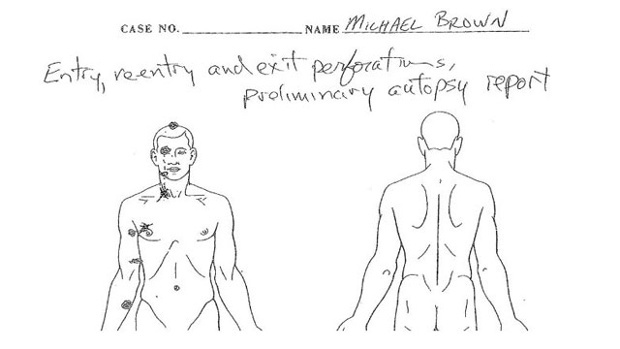 The Justice Department is investigating Brown’s death for possible civil rights violations. Since Brown’s shooting last Saturday, thousands of people have taken to the streets of Ferguson, Missouri to demand information and justice for what has widely been considered a reckless shooting and an act of racism.